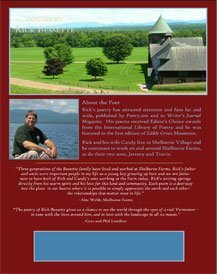 The poetry of Rick Bessette gives us a chance to see the world through the eyes of a real Vermonter – in tune with the loves around him, and in love with the landscape in all its moods. …Rick’s writing springs directly from his warm spirit and his love for this land and community. Each poem is a doorway into the place in our hearts where it is possible to simply appreciate the earth and each other—the relationships that matter most in life.